The 12.5% Corporation Tax rate remains unchanged. The R&D Tax Credit base year provisions will be phased out. The 3 year Corporation Tax exemption for start-ups is to be extended. A new “Knowledge Development Box” will be introduced to attract new inward investment. The “Double Irish” tax loophole is to be eliminated. All Irish-registered trading companies must also be tax-resident here. This will apply with immediate effect for new companies and will be phased in for existing companies. To encourage long term leasing of land, the income tax threshold for land leasing is to be extended by 50%. The CGT retirement relief on farm land is to be extended. The existing CAT relief on agri land is being restricted to actively farmed land. Stamp duty is being scrapped on long term land leasing. The stamp duty relief for farm transfers within families is being extended. The range of farmers’ Income Averaging is extended from 3 to 5 years. Income Averaging is also being extended to farmers with diversified farm income. The farmers’ flat rate VAT addition is up from 5% to 5.5%. The 9% VAT rate for tourism enterprises is being retained. The 0.6% pension levy is being scrapped at the end of 2014. The Home Renovation Incentive has attracted €190m worth of work so far. It is being extended to rental properties whose owners are registered for income tax. This comes in with immediate effect. The 7 year CGT exemption is being abolished. A refund of DIRT tax will apply to first time buyers who use their savings to buy their first home. The existing 80% windfall tax is being abolished. Income Tax relief at the standard 20% rate will apply to water charges paid by householders. The Foreign Earnings Deduction is being widened and extended to a range of new countries. 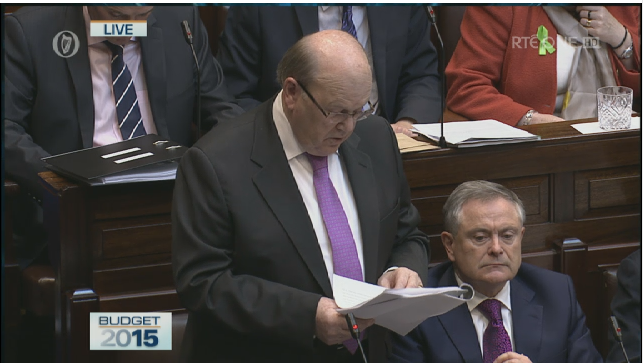 Today’s budget is intended to form the first stage in a 3-year programme of income tax reform and reductions. The USC entry point will be increased to approx €12,000 and the other USC bands will be increased accordingly. The 41% Income Tax rate is being cut t0 40%. The standard rate (20%) tax band is being increased by €1,000 per annum. A new USC rate of 8% for income in excess of €70,000. A new USC rate of 11% for self-employment income in excess of €100,000. Microbreweries will enjoy an increase an the annual excise exemption ceiling. The existing relief for microbreweries was originally introduced in 2005 by Brian Cowen as Minister for Finance. The price of 20 cigarettes will increase by 40 cents, with a corresponding increase in other tobacco products. No rise in taxes on alcohol, petrol, diesel or VRT.